Potatoes grown locally to our Kitchen, roasted in our Great Taste Award-winning Kentish rapeseed oil until crisp and golden. Available as part of our Stress-Free Christmas Lunch bundles or without the turkey in our side & trimmings bundle. 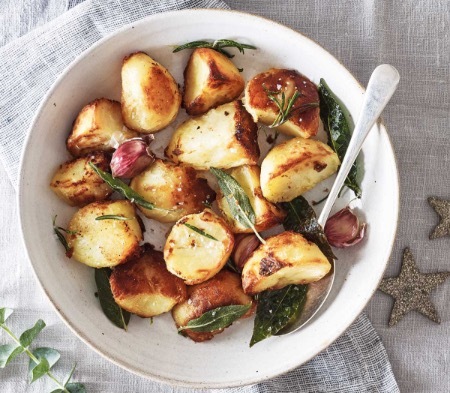 Potatoes (86%), Rapeseed Oil (13%), Salt, White Pepper. Made in our kitchen in Kent, using Rapeseed Oil from Kent. Pour a little olive oil onto a baking tray and place in a preheated oven. After 5 minutes, remove the potatoes from their packaging and place onto the tray. Return to the oven for 30 minutes, turning once halfway through cooking.